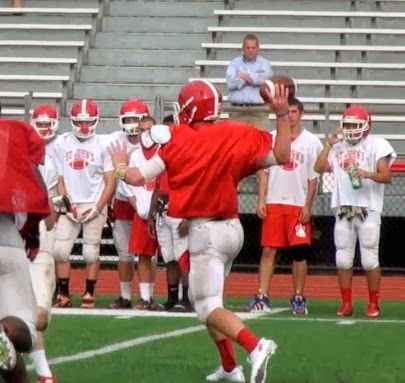 All State QB Andrew Smiley and the St. John's offense will have its hands full with Nashoba's defense this week. The top two teams in Central Mass passed their tests with flying colors this past weekend, as Leominster outgunned Shepherd Hill and Doherty ran past Tantasqua. For the Blue Devils, it was just another day at the office against the Rams, but the Highlanders needed a big win to prove they belong among the region's elite. They got that against a tough Tantasqua squad, and more, dominating all three phases of the game and solidifying their place as the favorite in Division 4. For the rest of our Power Rankings and an update on the Player of the Year race, along with a preview of next week's Game of the Week, keep reading below. Last Week: Ranked No. 1. Defeated Shepherd Hill 41-14. This game was actually close at halftime, but the Blue Devil defense put the clamps down on Shepherd Hill's double wing attack, pitching a second-half shutout and notching another impressive win for Leominster and coach Dave Palazzi. Last Week: Ranked No. 2. Defeated Tantasqua 33-7. Tantasqua decided to do everything in its power to take star receiver Isaac Yiadom out of the game. No problem for the Highlanders and quarterback Luke Brennan, who found WR/TE Alfred Adarkwah for a pair of scores, then rushed in another himself. Junior Jahkari Carpenter took a punt back 95 yards just before intermission, and the route was on in Sturbridge. Last Week: Ranked No. 3. Defeated Wachusett 14-0. The Nashoba defense is for real, giving up a Division 2-low 9.3 points per game. The offense isn't quite as explosive as it was a year ago, but senior fullback Frankie Chiodo is quickly becoming a touchdown machine in the red zone, and the Chieftain special teams blocked a punt to help Nashoba extend it's state-long winning streak to 29 games. Last Week: Ranked No. 4. Defeated Fitchburg 20-15. At first it appeared that Fitchburg was going to pull off a miracle against St. John's as a late Red Raider touchdown and 2-point conversion put the Pioneers down 15-14. But senior receiver Michael McGillicuddy somehow returned a squib kick 65-yards for the game winning touchdown as time expired. It wasn't pretty, but St. John's found a way to win. Video of the improbable kick return below. Last Week: Ranked No. 5. Defeated Westboro 28-27. A pair of untimely turnovers, including a fumble returned 99-yards by Westboro, nearly derailed what has been a spectacular start for the Hawks. But, in the end, the backfield duo of Dan Mendes and Dan Bothwell led a go-ahead drive, and Westboro could not convert an extra point to tie the game late. The Guardians stayed perfect with a game winning drive from senior quarterback This Boykin, topping Shrewsbury 34-32. The Wolverines rode senior Tom Rodrick on the ground to beat up Bartlett, and Auburn squeezed out a much needed win against Northbridge. BVT continues to roll, smashing every small school in its path. It's hard to see anybody in the Colonial beating the Beavers this season. Finally, even in a loss, Shepherd Hill stays on the watch list. The Rams proved they can physically match up with anybody, essentially playing one of the best teams in the state even for a half. But, in the end, once Leominster's defense adjusted to the Ram double wing, there wasn't much SH could do offensively. The Chieftains will face their biggest test yet as St. John's and it's up-tempo offense come to town this Friday. Nashoba's 29-game winning streak will be on the line, and just hours after the Pioneers' improbable win against Fitchburg, St. John's players were already Tweeting the hashtags #snapthestreak and #endthestreak. You think that win streak means something? The game itself will be interesting for it's prime time matchup of the speedy 3-5 Nashoba defense and the "Blur" St. John's offense that uses multiple receivers and a zone-read based ground attack. The biggest task for Nashoba will be doing what Fitchburg did a week ago: Keeping star Pioneer quarterback Andrew Smiley in the pocket. Much of that will be on senior linebacker Frankie Chiodo, but also the Chieftain defensive line to stay disciplined and not allow the speedy Smiley to break contain. On the other side of the ball, St. John's has been much improved defensively against the run, but is still susceptible to the intermediate passes that come underneath star safety Davon Jones. Whether or not the Chieftains, who have been mostly content to run the football, will let quarterback Matt Mudgett sling it is another story. Whichever strategy they choose, you know the Chieftains will be motivated to prove themselves against the Pioneers. The last team to beat Nashoba? St. John's in the 2010 Division 1 CMass Super Bowl. O'Connor's 180 yards and three touchdowns through the air powered the Blue Devils offense against a physical Shepherd Hill defense. Yiadom only had one catch in Doherty's win over Tantasqua, but it was a big one. The versatile senior hauled one in for 36 yards and caught a 2-point conversion. Smiley threw for 140 yards and a pair of scores, but was mostly held in check by Fitchburg. Still, he was able to move the ball in the second half against the Red Raiders without star receiver Davon Jones. Brennan sat out the later portions of Doherty's big win over Tantasqua with cramping issues, but by that time he had already thrown for two touchdowns and ran in another. While the Hawks endured a scare, Mendes kept on rolling, rushing for a pair of touchdowns, including the game winner. In The Hunt: Dylan Kierman, Sr. QB, Quabbin. Tom Rodrick, Sr. RB/LB, Leicester. Jarell Addo, Sr. TE/S, Leominster. Nic Wojnar, Sr. QB/LB, BVT. Mark Wright, Jr. RB, Auburn. Michael McGillicuddy, Sr. WR, St. John's. Quabbin fell to previously winless Gardner Friday night, but you could hardly blame Kierman, who accumulated over 350 total yards and threw four touchdowns. Rodrick may do more for Leicester than any other single player in the region does for his team, rushing for a touchdown and returning an interception 60 yards for another score in the Wolverines' 15-0 road win over Bartlett. Addo continues to be a key cog in the back end of Leominster's defense, but his touches on offense have been limited by the emergence of play makers Mayson Williams, James Gurley and Jake Allain. No matter for the UMass-bound athlete, who remains one of the most impactful players in the region. Wojnar continued his hot start, throwing for three touchdowns in BVT's dismantling of Worcester Tech, while Wright scored both of Auburn's touchdowns in a 15-0 win over Northbridge. McGillicuddy debuts on this list after making the play of the season, so far, with his 65-yard walk-off kick return to beat Fitchburg. But, it isn't just about one play. The competitive senior leads St. John's in every receiving category, and is tied for the lead in CMass with three receiving TDs, while ranking second in the region with 18 catches.